March 1, 2018 / CarrieKV / Comments Off on The 1st full calendar year of Data You Can Use! Although our nonprofit status was officially granted in May of 2016, 2017 was the first full calendar year for Data You Can Use. We’d like to share a timeline of our highlights with you. These events, milestones and projects are just a sampling of the work we did and the partners we collaborated with last year. Data portraits for nine Neighborhood Strategic Planning (NSP) Areas were released in January 2017. The portraits were designed with input and involvement from NSP coordinators, in partnership with the Nonprofit Center. The data included was useful for several purposes, including planning, organizing and fund development. Since that release, similar portraits were requested by neighborhood- focused agencies and foundations. Now our website hosts twenty-one reports that follow this community organizer-developed template. From a CPTED training which included Amani residents. Photo credit: Cassandra Leopold. Community Based Crime Reduction (CBCR), formerly known as the Byrne Criminal Justice Innovation grant, is intended to provide local governments with funding focused on community policing strategies and social cohesion. DYCU is the research partner on a grant awarded to the Milwaukee Police Department in the Amani neighborhood, with partners including: Amani United, COA, Community Advocates, DA’s Office, Dominican Center, Hepatha Church, LISC, Milwaukee County Sheriff’s Office, Milwaukee Police Department, and Safe & Sound. DYCU helped residents co-create and administer a neighborhood survey. March : What makes your neighborhood great? Too often, people come into a neighborhood to fix an issue. Failure to acknowledge that services, agencies, people and businesses already exist in the area can be a missed opportunity to build existing assets. Matt Richardson and Carrie Koss Vallejo walked through an asset map with community members, and Katie Pritchard facilitated a discussion on ABCD or “Asset Based Community Development.” In March, we posted blog on the event and a “Identifying Neighborhood Assets” tool to our website, updated with feedback from the neighborhood changemakers at this event, community organizers and volunteers. For a neighborhood organizer who knows that asthma is a big deal in their area, looking at County and State numbers can seem daunting and irrelevant at the same time. Finding small-scale data for neighborhoods is a challenge, especially for topics related to health. The CDC, Robert Wood Johnson Foundation and CDC Foundation collaborated on data for 27 indicators related to adult health for 500 Cities in the US at the census tract level. We explored this data and shared it with partners throughout the Spring. In April, we were discussing adding appendices to our neighborhood portraits and Katie was preparing to share this data set at our Data Day. Data Day is our signature event, when dataphiles connect to discuss all things data. 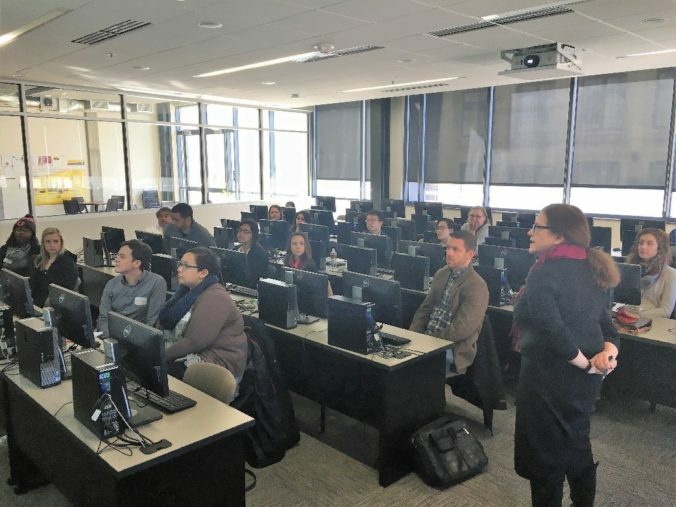 We hosted 20 speakers, a Data Dream competition (congratulations again to winner ACTS Housing), and a discussion that lead to the founding of our Health data Users Group (HUG). We experimented with a new format including IGNITE sessions. For those not in the know, IGNITE presenters get 20 slides, which automatically advance every 15 seconds. The result is a fast and fun presentation which lasts just 5 minutes. IGNITEs will be back this year – the sessions received Excellent and Good ratings from over 90% of our Data Day survey respondents! Save the date for the next Data Day coming up on Wednesday May 30th, 2018. Over the summer, DYCU worked with a team of community researchers interviewing residents of central Milwaukee neighborhoods. Residents of the 53206 ZIP code were trained to conduct the interviews, a twist on the normal research method! The intent was to look for residents’ perceptions of community organizing and its relationship to crime control. During the second phase of the project, the focus is on documenting existing agencies, leaders, and assets in Milwaukee’s African American community. Partners in this work include the NAACP, the Wisconsin Black Historical Society and Deborah Blanks from UWM. DYCU moved into the UWM Zilber School of Public Health. Our offices within the school allow us to partner with staff and students and network with other agencies, including the Milwaukee Health Department (MHD), with whom we co-host Van Le, our LISC AmeriCorps Service Member. From the first HUG meeting. Photo credit: Cassandra Leopold. With a group of founding members, we successfully launched the first Health data User Group (HUG) meeting. The founding group set forth some operating guidelines and proposed topics for future sessions. The purpose is to bring together neighborhood groups, public health officials, health practitioners and academics to explore how health data can be used to improve neighborhood conditions. After review by the Executive Committee and approval of its full membership, the National Neighborhood Indicators Partnership (NNIP)welcomed DYCU as its newest member. NNIP is a collaborative effort by the Urban Institute and local partners to further the development and use of neighborhood information systems in local policymaking and community building. Our partnership with NNIP has provided an effective forum to share and receive new ideas from organizations across the country. Turning the Corner is a national cross-site project that DYCU is involved in through NNIP and the Urban Institute. The project explores the post-recession housing market and looks for indicators of change, focusing on neighborhoods that have the potential to become unaffordable for current residents and businesses. The neighborhoods identified in Milwaukee for this project are Brewers Hill and Walker’s Point. In October, DYCU staff conducted a focus group and several interviews with residents of Walker’s Point. Look forward to our report which will be released in July 2018. The broader cross-site report is planned for release by NNIP in December 2018. Katie Pritchard and Bridget Clementi from Children’s Hospital, were invited by the National Neighborhood Indicators Partnership (NNIP) to participate in a special Summit on Health and Housing. This day-long program in Chicago preceded the Midwest Forum on Hospitals, Health Systems and Population Health. It was sponsored by ALL IN and brought together “health doers” who are using and sharing data to improve communities. Most projects are multi-sector, collaborative efforts. It’s a network of collaborations from across the country that provide technical assistance webinars, affinity group calls, one-on-one connections and an on-line community to connect with others in this work where few roadmaps are available. Our plans are to make these resources available to our Health data Users Group. Let us know if you’re interested! DYCU promotes neighborhood-level data with agencies that have neighborhood level expertise, including the 30th Street Industrial Corridor. In December, the Garden Homes Neighborhood Plan was launched, and we are excited to partner with this organization (and many others) which work to improve Milwaukee. On December 14th, the Community Development Alliance meeting took place at the Zilber School of Public Health. Katie facilitated a discussion on the Federal Reserve Bank of Chicago’s Peer City Identification Tool. We had the opportunity to do a deep-dive into the data with community members who are actively involved in revitalizing Milwaukee’s neighborhoods and commercial corridors. This Spring, Data You Can Use sponsored a session at the Zilber School of Public Health highlighting three new sources of data that can help promote healthy neighborhoods. Participants included representatives from health clinics, hospitals, community development corporations, neighborhood organizations, the City Health Department, faculty and students from UWM and the Medical College of Wisconsin and United Way. The slides from the session are available on our reports and presentations page. people with lower incomes have a significantly shorter life expectancies. the Milwaukee Community Data Base, a local portal for a range of data from a variety of sources. CityHealth rates the 40 largest US cities on nine evidence-based policies that affect health. It offers information on nine policies, by city and by policy. For example, evidence shows that health outcomes can be affected by paid sick leave laws, high-quality, universal pre-kindergarten, affordable housing/inclusionary zoning policies, alcohol sales control, Tobacco 21 policies, healthy food procurement policies and complete streets policies. Each city gets a rating and some earn a bronze, medal or gold depending on the policy. Milwaukee received medals in three of the nine categories, suggesting there is much to be done. The group was interested in the “data deep dive.” For each policy, the site provides the full codebook, the data and, of most interest, the evidence. This is a great resource for assuring funders, board members, public officials, and most importantly, the residents in your neighborhood, that there is some evidence that the policy will make a difference. For dataphyles, this is an exciting new data set made available through the Robert Wood Johnson Foundation and the CDC. For people who care about health and neighborhood conditions, this is a tool to better understand and address health disparities. Although there is a growing understanding of the impact of place on , there has only been limited data available at the county and city levels. And we know that county and even city level data masks the disparities that are so important to address. Now, for the first time ever, we can access the 500 Cities database and see the differences at the census tract level! There are 27 variables, reflecting unhealthy behaviors, health outcomes, and preventative measures. In Wisconsin, the data are available for Milwaukee, Madison, Green Bay, Kenosha, Racine, Appleton and Waukesha. Using reliable small area estimations, we can compare Milwaukee to the state and national numbers, and for neighborhood enthusiasts, we can now compare neighborhoods within Milwaukee. In a hyper-segregated city like Milwaukee, we are accustomed to seeing highly clustered data. The 500 Cities data reveal some interesting differences that should be affecting the way we target our resources. The MapBook for Milwaukee is available on our website and has each of the indicators mapped across the census tracts. For those who want to examine comparative areas, the actual data can be accessed and used interactively. The Milwaukee Community Data Base is a portal to readily available data. The group explored how this could be used to identify housing built before 1951 and therefore more likely to have lead-based paint and/ or plumbing. Combining this with other available information could help identify local health needs and mobilize solutions. For a neighborhood group, the ability to match street addresses with both young children, and the threat of high blood lead levels, provides the ability to target education and water filter distribution. The “quickie critique” suggested that the session was well received. I liked the variety of data sources covered. I liked the introduction to new data sets that I will certainly be able to use in my work. I really appreciate you all taking the time to share these tools. I liked learning about and getting to play with the datasets, A very helpful resource—thank you! There is a great cross section of health/neighborhood representation here! I like that it was in the computer lab so I could look through the sites while learning about them. Besides a suggestion to add wine to the session (it was a Friday afternoon after all), one recommendation that came from several attendees was to provide more examples of how the data could be used. At Data Day 2017 MKE last week, we posted the 500 Cities map for Milwaukee throughout the day and participants took a data walk, noting some patterns unlike our usual heatmaps. This group agreed: there is much to explore. So… to get things started, we’ll be convening a group of interested stakeholders to form a “users group” to explore the use of health data at the neighborhood level. If you’d like to join us, please contact katie@www.new.datayoucanuse.org before July 6th 2017 and we’ll find a time to get started! Imagine if every community nationwide had access to their own data — data on which children are missing too many days of school, which neighborhoods are becoming unaffordable, or where more mothers are getting better access to prenatal care. This is a reality in some areas, where neighborhood data is analyzed to evaluate community health and to promote development. Cleveland is studying cases of lead poisoning and the impact on school readiness and educational outcomes for children. Detroit is tracking the extent of property blight and abandonment. But good data doesn’t just happen. These activities are possible because of local intermediaries, groups that bridge the gap between data and local stakeholders: nonprofits, government agencies, foundations and residents. These groups access data that are often confidential and indecipherable to the public and make them accessible and useful. And with the support of the National Neighborhood Indicators Partnership (NNIP), groups around the country are championing community development at the local level. Without a local data intermediary in Baltimore, we might know less about what happened there last year and why. Freddie Gray’s death prompted intense discussion about police brutality and discrimination against African-Americans. But the Baltimore Neighborhood Indicators Alliance (BNIA) helped root this incident and others like it within a particular place, highlighting what can happen when disadvantage is allowed to accumulate over decades. BNIA, an NNIP member, was formed in 2000 to help community organizations use data shared by government agencies. By the time of Gray’s death, BNIA had 15 years of data across more than 150 indicators that demonstrated clear socioeconomic disadvantages for residents of Gray’s neighborhood, Sandtown-Winchester. The neighborhood had a 34 percent housing vacancy rate and 23 percent unemployment. The neighborhood lacks highway access and is poorly served by public transit, leaving residents cut off from jobs and services. With BNIA’s help, national and local media outlets, including the New York Times, MSNBC and the Baltimore Sun portrayed a community beset by concentrated poverty, while other Baltimore neighborhoods benefited from economic investment and rising incomes. BNIA data, which is updated yearly, has also been used to develop policy ideas to revitalize the neighborhood, from increasing the use of housing choice vouchers to tackling unemployment. Local data intermediaries like BNIA harness neighborhood data to make underserved people and unresolved issues visible. They work with government agencies to access raw data (e.g., crime reports, property records, and vital statistics) and facilitate their use to improve quality of life for residents. But it’s not easy. Uncovering useful, actionable information requires trust, technical expertise, knowledge of the local context and coordination among multiple stakeholders. This is why the NNIP is vital. NNIP is a peer network of more than two dozen local data intermediaries and the Urban Institute, working to democratize data by building local capacity and planning joint activities. Before NNIP’s founding partners, there were no advanced information systems documenting and tracking neighborhood indicators. Since 1996, NNIP has been a platform for sharing best practices, providing technical assistance, managing cross-site projects and analysis, and expanding the outreach of local data intermediaries to national networks and federal agencies. The partnership continues to grow. In order to foster this capacity in more places, NNIP has just released a guide for local communities to start a data intermediary. When used properly, data can reveal patterns within anecdotes, suggest potential solutions and validate the lived experiences of people too often overlooked. As open data efforts spread, government agencies will release more and more data to the public. Local data intermediaries will be even more valuable in helping users sort through the data to surface, explain and address the issues distressed communities face. Matt Lawyue is a communications associate with the Metropolitan Housing and Communities Policy Center, and Kathryn L.S. Pettit is a senior research associate with the Metropolitan Housing and Communities Policy Center, at the Urban Institute. Pettit is also the director of the National Neighborhood Indicators Partnership. Cross Lutheran is a church in Milwaukee’s central city, and its Bread of Healing Empowerment Ministry (BOHEM) offers a meal program and food pantry, serving Milwaukee residents who experience poverty and hunger. Funders were interested in BOHEM’s measurable outcomes and the program’s impact. Program staff and volunteers worked to co-create an interview tool that could be administered by trained volunteers from other congregations who serve food at the meal program and pantry. “Guests” of the pantry participated in the interviews and talked about changes in their lives because of their involvement in BOHEM programming and services. As a result of the survey, BOHEM found ways to improve their communication about available services, volunteers from other congregations began to think more critically about what partnership and collaboration mean, and guests noted the importance of the resources being more than a source for food, but also an opportunity to give back or pay it forward. For all involved, it provided the opportunity to have a deeper conversation about racism, poverty and privilege. A summary of this work was recently presented at the Hunger Summit, hosted by Feeding Wisconsin, in May 2016 in Wisconsin Rapids, WI. If you’d like more information or a copy of the presentation, please contact Salma Abadin. Highlights from the most recent National Neighborhood Indicators Partnership meeting in San Antonio. Find out what ‘s happening in partner cities that are concerned about using data to improve neighborhoods. Katie Pritchard, from Data You Can Use, will provide a summary of resources and possibilities that may be of interest to you and your neighborhood work. This will be provided for staff from Healthy Neighborhoods and may be open to others with interest. For more information, contact Darlene Russell at the Greater Milwaukee Foundation. Zilber School of Public Health on Thursday June 16th from 9:00—11:30. Gain experience in using the US Census Bureau’s American FactFinder data access tool. Learn about what data are available, how to access the data sets, and how to use the data to inform decisions in your neighborhood. The training will be led by Salma Abadin and Carrie Koss Vallejo of Data You Can Use in partnership with the Nonprofit Center. Participants are welcome to bring their laptops or use the computers in the facility. This will be “hands on” training primarily for CDBG agencies. For more information, contact Joyce Mallory at the Nonprofit Center. This open source mapping training is an opportunity to learn best practices which can be applied across tools, with an opportunity to apply them using MapBox Studio. The training will be led by Carrie Koss Vallejo and Salma Abadin of Data You Can Use in partnership with the Nonprofit Center. By the end of the session, attendees will have created a resource map* in Milwaukee! Participants are welcome to bring their laptops or use the computers in the facility. This will be “hands on” training primarily for CDBG agencies. Theory of Change? What’s that and why do I need one? Wednesday July 27, 9:00–11:00 at the Nonprofit Center. Have you been asked by a funder “But what’s your theory of change?” What do they mean by this and why do they need to know? Find out why a developing your theory of change can be just what you need to improve planning, evaluation, and community engagement around your social change work. Presented by Katie Pritchard, Data You Can Use, in partnership with the Nonprofit Center. * The first three trainings are primarily for staff of CDBG agencies, and open to others as space permits.